I started using Dorn over 14 years ago and to my delight saw immediate positive results; when referrals, recommendations and great feedback started to follow soon after this just added even more delight! It was quickly obvious that so many people could find relief from unnecessary pain and discomfort if they had access to this wonderful therapy. I began receiving calls from distant parts of the UK and even today have clients who travel to me from far off towns, cities and even other countries for Dorn therapy, so what was also evident was a need for more Dorn therapists! Therefore it is my wish to see as many Dorn Method therapists in the UK as there are now in Germany, where The Dorn Method was founded; being a native German from Bavaria, i.e. speaking the language, and also being brought up only a few miles from where Dieter Dorn himself practiced and taught, it seemed obvious to me to try to develop The Dorn Method in the UK. My aim therefore is to develop The UK Dorn Method Centre into a total learning and information resource for Therapists who wish to add Dorn to their range of treatments and therapies. I'll also try to provide as much assistance as I can, helping Therapists to promote and develop their own Dorn Method Practices through a range of literature and products available at this website (see below). It is still early days however, and I am working extremely hard on all areas of The UK Dorn Method Centre including teaching methods and materials, and therefore welcome feedback and suggestions from others, and as such have provided a feedback form below. Please do get in touch with whatever questions or feedback you may have, I'd love to hear from you. After I became an Authorised Dorn Method Instructor, I started holding regular Workshops, the first of which was held in 2008. It is my intention to set a high standard of Dorn Method training which adhers to principles and foundations observed by the association of 130 or so Authorized German Dorn Method trainers who form a loose controlling body and who can be found at DornFinder.org and who also get together each year at the German Dorn Kongress. I therefore also encourage Dorn Method students to attend further training at practice/competency days as well as Advanced Dorn Method Workshops for further certification. I'll add more details to this website covering these topics shortly. Students who come onto one of my workshops will have access to a resource area at this website. 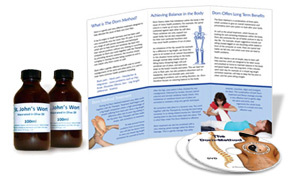 The aim is to provide additional comprehensive resources such as books, manuals, charts, research papers, etc., to help further educate and promote The Dorn Method. If you need access, please email me for a registration token so you can register online. This section of the website offers Therapists products they can use whilst working with Dorn, and to help them promote their Dorn practices. I know it can be costly to develop your own leaflets, posters, etc., so I thought it would help if I spent the time creating such products and made them available at as low cost as possible. I always work hard to improve both my training and the type of help I can offer Dorn Method Therapists to establish themselves. Therefore your Feedback is vitally important and if you have any comments, suggestions or anything to say that might help, your feedback would be much appreciated. Please use the form below.